I have been rehearsing very closely with my professor, researching various different performances and gaining perspectives on how they play the role, and I've been working on my Yorkshire accent through different books and videos! It's been a really fun process so far, and I've learned so much about my character, the musical itself, and about myself as a performer. I'm really excited to see it all unfold on stage and see the final product! I chose to come to NUOVA this year because I am so passionate about performing, and I've only heard praises about NUOVA from my classmates who have been here before. I am always looking to learn and grow, as both a person and performer, so I think this program is perfect for that. I am so excited to work with the amazing faculty and talented castmates and see the improvements that I can make within these 6 weeks. I'm hoping that this program will really help me grow and flourish as a singer. 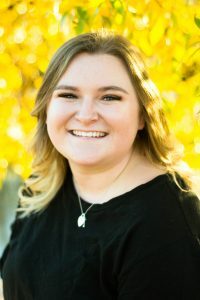 Ashley Schneberger, from Cochrane, Alberta, is currently a 3rd-year Vocal Performance student under the teachings of Dr. Janet Youngdahl at the University of Lethbridge. She has been featured as Old Lady from Bernstein's Candide alongside the Lethbridge Symphony Orchestra, Dorothée from Massenet's Cendrillion, and Gilette from Franz von Suppe's Ten Belles and No Ring. She has participated in Kiwanis festivals at the provincial level in Cochrane, Calgary, Airdrie and Okotoks. After finishing her undergrad degree in 2020, Ashley hopes to pursue a Masters in Opera Performance, and continue performing to let her love of music blossom.